Nvidia has claimed that thanks to the use of its GPUs and deep learning technology, we are on the cusp of "a new age of intelligent medical instruments". In a new blog post the graphics chip maker details how the Xray, CT, 3D ultrasound, and MRI scans of old can be transformed into volumetrically rendered or even cinematic renderings of your innards. These visualisations aren't just impressive they can more quickly highlight problems and thus save lives. Volta GPUs are behind these impressive advances, says Nvidia. The performance and efficiency of these processors enables scientists to "apply deep learning to the imaging challenge", we are told. One particular partnership with GE Healthcare, leveraging Nvidia GPUs in the firm's new Revolution Frontier CT, provides the signal processing power for improved image quality with lower X-Ray dosages (up to 80 per cent lower). Various algorithms run on the GPUs can be used for image reconstruction, and medical detection, classification and segmentation. A more advanced application facilitates volumetric 3D rendering of the inside of a patient. This technique leverages CT and MRI data which are 3D post-processed to visualize complex anatomical information. Nvidia says that thanks to this technology doctors can manipulate and view images from different perspectives to get a good spatial understanding of the anatomy. Last but not least Nvidia discussed a futuristic looking approach to medical imaging called Cinematic Rendering. What inputs are used for this visualisation technique aren't detailed but they are likely similar to those used by volumetric 3D rendering above. With the raw scans plus global illumination techniques (popular in computer animation) photorealistic images can be generated. Nvidia is proud to work in the medical sciences where its GPUs can be harnessed to help combat disease and save lives. In a related announcement yesterday, Nvidia blogged about its collaboration with GE Healthcare and Nuance. 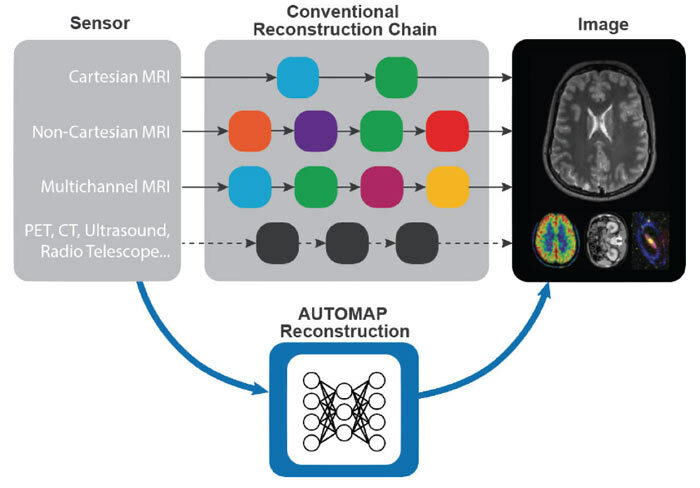 Working together the firms have leveraged Nvidia's deep learning platform to bring AI to medical imaging in the GE Revolution Frontier CT. This CT scanner is twice as fast as its predecessor and Nuance's image-sharing and reporting software speeds along radiologist workflows - improving the efficiency of disease detection, diagnosis and treatment. Interesting article. As a practising interventional radiologist, I have a working knowledge of these types of technologies on a day-to-day basis. After reading your article, however, I didn't really understand what Nvidia were actually promoting here as I do some of these things everyday anyway and other things mentioned I don't see the medical use for other than producing nice pretty pictures. Anyway, having read the source, I think I have a better understanding… Essentially, the first medical image shown in the article is actually what I would call a multiplanar volume mapping and that means that the computer will look at an organ such as the prostate gland in different planes and delineate it's margins and work out its overall volume. This is useful, for example, to see if a tumour is growing, shrinking or staying the same when looking at a patient with multiple scans at various points during their treatment. Currently most radiologists would just look at the gland in one plane and measure if it is increasing in maximum dimension or they would manually do the job that this computer is automating but that would take a long time for every scan looked at. Where I work if we needed volume mapping then we would send the scan to a 3rd party to do it for us (at cost) as it would take me too long. The second thing they are advertising their prowess at, is taking an organ such as the aorta and separating it from other organs so that it can be viewed in isolation. This is something I do everyday. The computer I use has a function to do it automatically but it is not very good. It often gets mixed up with what is aorta and other structures nearby. I therefore do perform this task manually as I can do it more accurately and with better results than the computer will do. My brain is better at working out where the blood vessel and where it is flowing and what it's margins are than the computer. Nvidia is claiming that their Volta GPU will do a better job. The last thing they are advertising ‘cinematic’ just sounds a bit like nonsense to me. Using lighting effects to simulate the texture of organs will not improve diagnostic capabilities. The example they have shown above is in no way photorealistic to the real organs. They have applied a colour map to the 3d volumetric reconstruction which is ‘bone’ in nature. 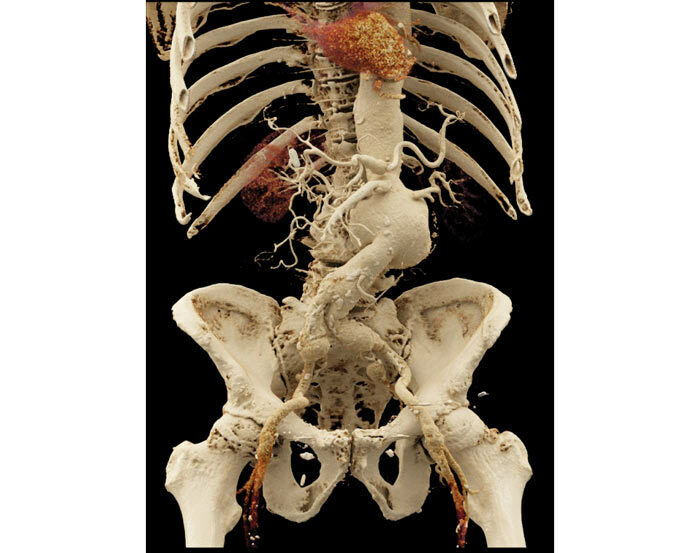 This makes the aorta and iliac artery aneurysms shown in the image look like bones. Common sense would tell you that arteries such as the aorta are red in reality. Not the colour of bones. That is such an awesome idea, hope they succeed with this..!